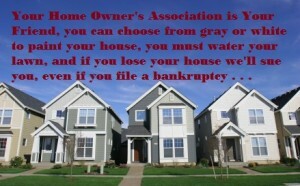 An HOA May Sue Even After Bankruptcy! THE BANKRUPTCY CODE SPECIFICALLY ALLOWS IT! The Rule is that you can eliminate your personal liability to pay your Home Owner’s Association up to the date that you file your case. But what happens AFTER? While filing bankruptcy stops Foreclosure, you must still either work out a loan modification or setup a CHAPTER 13 payment plan in order to strip off the 2nd mortgage and catch up the arrears on your 1st mortgage. If all goes well, you won’t ever have to think about your HOA, you just continue to pay it and move on. IF THE ABOVE DOESN’T WORK OUT, YOUR AIM MUST BE FOR A SHORT SALE to avoid a Foreclosure after Bankruptcy. Doing a Short Sale will take the Home Owner’s Association into account as part of the final deal and that will be that. It also keeps a foreclosure off of your credit. A foreclosure is a lot worse on your credit than either a bankruptcy, a short sale or even the two of them combined. But if you end up with a Foreclosure after Bankruptcy . . . If you can’t pay a Chapter 13 payment (YOU MUST CONSULT A BANKRUPTCY ATTORNEY TO BE SURE, NEVER ASSUME ONE WAY OR THE OTHER WITHOUT A CONSULTATION FIRST), & if you cannot pay your 1st, you are going to lose your property. So, File a Chapter 7 Bankruptcy: Your 2nd or HELOC will no longer be able to sue once your Chapter 7 has discharged. You can stay in the property a bit longer while saving up to move. You could get a couple or even several extra months Rent-Free! But if you don’t do a short sale, you will eventually have a foreclosure. Your HOA will be able to sue you from the date that you filed your Bankruptcy until the day your property is foreclosed. I have seen this more than once, a couple assumes that a short sale is on track, and then it doesn’t go through. Meanwhile they have not been paying the Home Owner’s Association fees. Probably they haven’t paid for a year prior to filing the bankruptcy so they are out of the habit of paying it. Once the bankruptcy took place, they still didn’t pay because they couldn’t afford to, or they assumed that the short sale would take care of it. You may still be trying for a short sale even during your Bankruptcy. However, if you don’t pay, and there’s a foreclosure, you’re going to owe all HOA fees and assessments from the day that you filed until the day that you no longer owned the property. Because they banks don’t want to pay the HOA fees either, I have seen them take a couple years to actually repossess a house, especially if the family has already moved out. $150/mo in HOA fees plus special assessments, attorney’s fees and costs adds up pretty quickly. SO CONTINUE TO PAY THE HOME OWNERS ASSOCIATION FEES UNTIL THE PROPERTY IS SOLD OR FORECLOSED. If you don’t want to pay the HOA Fees to the HOA because you expect a short sale to take care of it, put the HOA Fees into a savings account just in case the short sale doesn’t go through. If it doesn’t go through you just pay them. If it does go through, you have a small savings account to use as moving money, or maybe replacing your appliances. I live in Maryland. 2 years ago the condo property appeared in the paper for forclosure in July 2010. I moved out of the property that month. Early in 2011 I went by the property to see what was up, somone had put a long screw through the door and door jam. So, I was not going to try and get in even though I had the key. I just filed bankruptcy in June 2012. The house has been in foreclosure for over 3 years, HOA fees are over $10,000. My lawyer tells me on the day of bankruptcy court that I am liable for HOA fees. I find that very unfair. The property is worth $125,000 with a $228,000 mortgage on it. Taylor Bean and Whitaker who had the loan on the property transferred it to Bank Of America. The send me forms to my address which has changed twice since I moved out of the property. Unfair loan practices where a mortgage broker had a an apraisel done where they fudged the properties worth so Taylor Bean & Whitaker would refiance in 2009, but the broker was supposed to pay off all my unsecured debt but that did not happen at the closing table. I turned in pay statements that showed overtime, they based income on that which they should not have done. My pay was not enough to pay the loan but they hung me out to dry anyway. So, it is a big mess. I am trying to put all this behind me but would love to be able to sue someone like the lady who recently blew the whistle on banks about loans. She was given like $18 million in class action lawsuit. I don’t want the property, been trying to turn over the keys for two years, no one wants it. So it goes unoccipied for the last 26 months rotting away. What are you gonna do.